My very good friend, Min, was over at my apartment last weekend. We often bake together and I recently shared with her my molten chocolate cake recipe. She used the recipe for a few recent parties and the dessert was very well received. Last weekend she suggested that I post some of our favorite recipes on the blog. 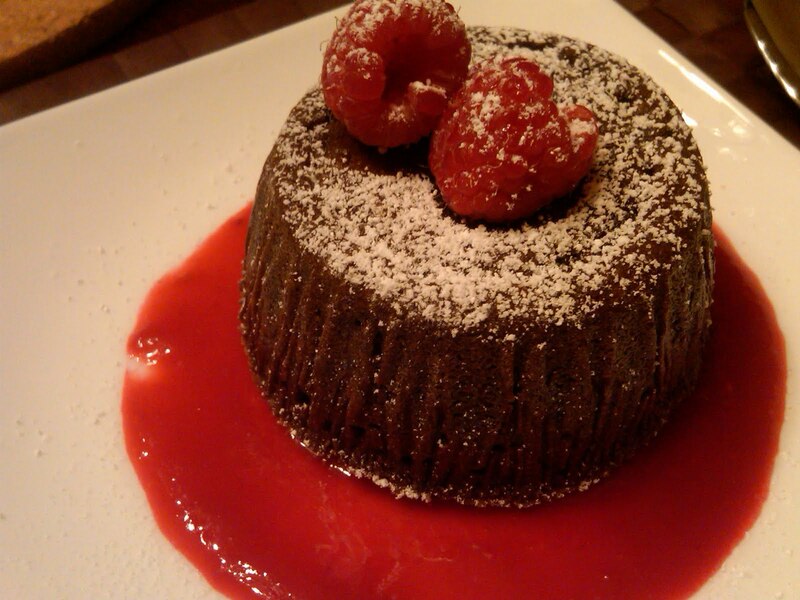 So here's one of our all time favorite - Molten Chocolate Cake. It's so simple to make, you'll never pay $10 for molten chocolate cake again at any restaurants. Prepare ramekins/aluminum tin cups by coating the inside of the conatiner with softened butter. Preheat oven to 425F. Melt chocolate and butter in a stainless steel mixing bowl over a bain marie. In a separate bowl, mix together eggs, yolks and sugar. Add melted chocolate/butter mixture to the egg mixture gradually, stirring constantly so the eggs are tempered and do not scramble. Once all chocolate/butter mixture is completely combined with the egg mixture, add the flour. Incorporate the flour completely with as few strokes/stirs as possible. Pour the batter into prepared ramekins and bake at 425F for 15 minutes. Unbaked batter can be frozen in individual ramekins/cups for up to 4 weeks. Bake for 18 minutes if the batter is cold or frozen. I like to serve the molten chocolate cake with raspberry compote or orange liquor flavoured whipped cream. My husband likes it with good quality vanilla ice cream. What a beautiful looking dessert! And so simple ingredients! I'd never have known that.